A U.S. Army Captain, William Gardner, invented a .45 calibre crank-driven, two-barrelled gun. He sold the manufacturing rights to Pratt and Whitney who then developed the gun using their own expertise. Gardner, having lost control of the design, set up his own company to manufacture guns in 1879, and later established a business in the United Kingdom [Gn6]. Pratt & Whitney continued to develop their version in the United States, and a variant of Gardner's original design proved surprisingly efficient when tested in Washington in 1879, firing 10,000 rounds in 27 minutes [Gn5]. However, the US Military would not purchase the weapon. Pratt & Whitney, and particularly their senior engineer Edward Parkhurst, developed many improvements such as an 'improved' lock mechanism, water cooled barrels and a two-column gravity feed magazine (1880). The Pratt & Whitney Parkhurst design 'Gardner' guns are most commonly seen in the United States. Gardner's guns, built to his 1879 patent for 1 or 2-barrel machine guns, and the 1881 patent for a 5-barrel gun were adopted by the United Kingdom and sold overseas. There are, therefore, two variants of Gardner guns - the ones built from Gardner's 1879 and 1881 patents, and the `Pratt & Whitney' - Parkhurst designs . The majority of the information in this page is taken from Lieutenant Colonel George M. Chinn USMC's book 'The Machine Gun', Volume 1, dated 1951 [Gn5] and from James W. Alley's essay 'Rifle Calibre Artillery: The Gardner Battery Gun', American Society of Arms Collectors Bulletin No. 89 [Gn6]. Mr Alley's article provides much more information on the activities of the Gardner gun manufacturers, and is strongly recommended as probably The definitive history of the Gardner gun. William Gardner (born Marietta, Ohio 1843, died London, England 1887) invented his machine gun in 1874. The first model was built entirely by hand, but being unable to finance production he sold the manufacturing rights to the newly formed company of Pratt & Whitney, Hartford, Connecticut. Gardner would receive a royalty on each gun delivered. The prototype was turned over to Pratt & Whitney, and in less than a year they had produced a weapon thought capable of meeting military requirements. A 2-barrel and single barrel version were tested at the United States Navy Yard, Washington, D.C. in November 1875 and although greatly commended, needed improvements to the feed system. These improvements were made by Edward G Parkhurst, an engineer employed by Pratt & Whitney, and the resulting patent rights were shared between himself and the company. Additional tests were carried out in 1877 to try out the new feed system, which was then deemed reliable. However, the Army showed no interest in the Gardner gun, feeling, no doubt, that the Gatling was sufficient for its needs. Gardner, ‘the inventor', seeing no orders coming from the U.S. Government and his gun being drastically modified by Pratt & Whitney, formed a company to manufacture his patent gun. The Gardner Gun Company was formed in August 1879 for the purpose of manufacturing Gardner Patent guns. [Gn6]. From this point onwards there were two companies manufacturing ‘Gardner’ guns – the Gardner Gun Company, which as will be seen later relocated their main manufacturing base to England, and Pratt & Whitney who built an ‘Improved Gardner’ gun to the design and patents of Edward Parkhurst. The two companies were in competition throughout the 1880s. As a result, the majority of 2-barrel Gardner guns that can seen in the United States are Pratt & Whitney Improved Gardner guns to the Parkhurst patent, while those seen in the United Kingdom have been made to William Gardner’s patent. Animations illustrating the different operating and feed mechanisms can be found on this site. Gardner, in seeking clients for his company, sent agents to Europe. The British Navy saw that the light, inexpensively produced highly mobile Gardner, used in conjunction with their Gatlings, would answer some pressing naval problems. Gardner accepted an invitation to visit England and demonstrate his weapon. A single barrel gun was demonstrated to British War Office in 1878, and 2-barrel guns to the Admiralty in 1880. The Admiralty not only adopted the gun after trials proved its worth, but also purchased manufacturing rights for to build the arms, provided the inventor would remain in England to supervise their construction. Gardner agreed and moved to England where he resided until his death in 1887. 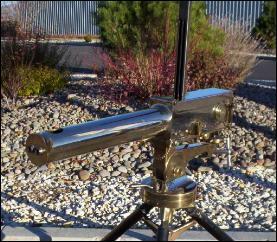 2 barrel Gardner gun from 1885, to Gardner's 1879 design. Although the Navy made use of machine guns, the Army was opposed to their use. The British Government ordered a selection committee to examine all existing systems of machine guns for the purpose of military adoption, and it reported on 21 March 1881. The exhaustive trials of different machine guns found that the Gardner patent gun had been the preferred gun in 9 out of 10 points of comparison. 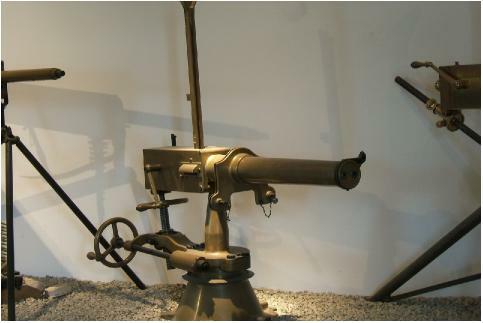 It recommended that the 2-barrel Gardner gun be adopted by all branches of the service where a light weapon could be used and a limber or similar artillery transportation was not required. The committee also noted that the Boxer cartridge, adopted by the British as a rifle cartridge, was unsuitable for use in machine guns, as it gave trouble when tried in both the Gardner and Gatling guns. Further trials of the 1, 2 and prototype 5 barrel guns were carried out in July 1881 and following this the Gardner Gun company received a large order from the British Government. The first 5 barrel gun, patented in August 1881, was delivered in July 1882. The writing was on the wall, however, once Hiram Maxim had patented his automatic machine gun in July 1885, where the breech mechanism was operated by the recoil caused by discharge. Orders for hand powered Gardner guns dried up after 1891 and the company folded in 1895. Following the tests in 1877, Pratt & Whitney, who owned the manufacturing rights to Gardner’s 1876 patent, made further improvements to the operating mechanism and feed system. 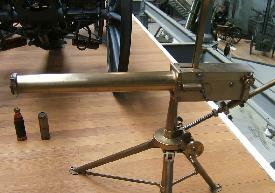 The resulting gun, still based on Gardner’s 1876 patent, but with barrels enclosed in a brass sleeve, was tested at the Washington Navy Yard on 17 June 1879 with the gun being operated by Francis Pratt and Amos Whitney. In all 10,000 rounds of .45 inch ammunition were fired in an elapsed time of 27 minutes and 36 seconds, excluding some 5 and a half minutes needed to clear stoppages on one of the barrels. Significant improvements were made by Edward Parkhurst to produce the Improved Garner, incorporating a different firing spring and feed arrangements and enclosing the barrels in a water jacket. The Army ran trials using the Improved Gardner at the Sandy Hook Proving Grounds, completing in January 1880. After the trials, the examining board stated that the Improved Gardner gun was reliable, simply constructed, light in weight and easily operated. It recommended that the War Department buy a limited number for actual use in the field service, especially since the cost of the weapon was so much less than that of other machine guns offered to the Government. A small number of Improved Gardner guns were purchased. 1874 William Gardner invents his gun. The basic characteristic is the translation of a circular motion of a crank into forward and backward motion of a lock and plunger. 1876: First Gardner patent. US 174,130 on 29 February 1876. This Patent described a mechanism for loading and firing alternate barrels. The patent applied to guns with an even number of barrels, and drawings show a six barrel device. Each pair of barrels was supplied from a single column of cartridges, with a distributor to feed the barrels alternately. 1879: William Gardner Patent No. 216,266 dated 10 June 1879. This design is for a 2 barrel gun, or a single barrel gun. Ammunition is fed from a single column and distributed alternately by a cam driven from the hand crank. 1880: Edward G. Parkhurst, and employee of Pratt & Whitney, Patent No. 228,777 dated 15 June 1880 (but filed on 22 January 1880) , assigned to himself and Pratt & Whitney. This is a design for a 2 barrel gun, using Gardner’s concept of a U-shaped lock driven by a crank. The lock is significantly different from Gardner’s, and employs a spiral spring within the lock and a release catch at the rear of the plunger. The crank disks are not cut away as in Gardner’s patents. In addition, ammunition is supplied in a two-column feeder. A feeder plate regulates the flow of cartridges into the space before the locks, and side arms driven by cams on the side of the locks to ensure spent cartridges are positively ejected. This is the design illustrated in Lt. Col. Chinn’s book on Machine Guns [Gn5] and also seen in YouTube. 1880: Edward G. Parkhurst, Patent No. 229,007 dated 22 June 1880 for a cartridge feed case for machine guns. Patent was assigned to himself and Pratt & Whitney. This patent described a cartridge case of wood, drilled for a number of cartridges and fitted with a sliding metal cover that retained the cartridges. Additionally, the receiver of the ammunition feeder was made flared to assist in locating the cartridge heads in the correct position. 1880: Edward G Parkhurst, Patent No 231,607 dated 24 August 1880, for a device for keeping the barrels of machine guns cool when firing. Parkhurst shared the Assignor rights with Pratt & Whitney. This is a water jacket that surrounds the barrels. 1880: Edward G. Parkhurst, patent No. 231,927 dated 7 September 1880 for a cartridge packing and feeding case. This relates to the pasteboard cases in which cartridges are packed and carried to be used in machine guns. The patent describes a device by which the cartridges can be held in their sockets in the case when held or turned in any direction without falling out until they are securely placed in the grooves of the machine gun’s feeder column. 1880: William Gardner and Edward G. Parkhurst, Patent No. 235,627 dated 21 December 1880, for a Cartridge Feeder for Machine Guns. Patent was assigned to Pratt & Whitney. This is a design for a cartridge case that can be used to load cartridges directly into a feeder that has widely separated columns. The case contains two banks of cartridges for efficiency. 1881: William Gardner, Patent No. 245,710 dated 16 August 1881 for a 5 barrel machine gun. 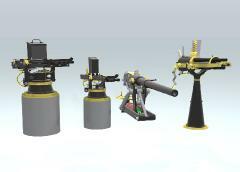 This is the design for the 5-barrel machine gun shown in the animation. It can be arranged to fire in a ripple or in a volley. The locks are very similar to those in Gardner’s earlier two patents, and as before the crank disks include a cut-away portion to release the hammers. 1882: Edward G. Parkhurst, Patent No. 259,040 dated 6 June 1882 for an ammunition box. Patent was assigned to Pratt & Whitney. This design was for an ammunition box which was simple in construction, light, and inexpensive, and which would be perfectly tight and water-proof and at the same time readily and easily opened. The award of separate patents to Gardner and Parkhurst/Pratt & Whitney can explain why the Gardner guns commonly seen and used in the United States differ from the guns seen in the United Kingdom museums. The U.S. guns are based on the Parkhurst patents held by Pratt & Whitney; once Gardner had broken his business connection with Pratt & Whitney in 1878, they could not use his later patents without paying a fee. Likewise, the guns built for the British Government used Gardner’s own patents, but could not use those held by Pratt & Whitney. 2 Barrel Gardner gun, on naval mount (UK), 2-Barrel Gardner to Parkhurst's design (courtesy of Special Interest Arms), and the lock mechanism of a 5-barrel Gardner gun (UK).